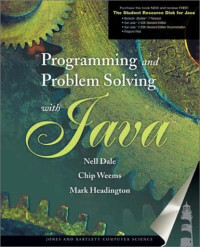 Programming and Problem Solving with Java™ is an excellent resource for discovering Java as a first programming language. After introducing the very basics of programming, the text provides detail on Java syntax, semantics, classes and objects, and then continues with coverage of arithmetic expressions, selection and encapsulation, file objects and looping statements, and object oriented software design and implementation. With an unparalleled clarity of expression, the authors then introduce inheritance, polymorphism, and scope, as well as event-driven input and output, arrays, and recursion. Through the case studies, exercises, and programming examples, readers develop a secure foundation for future study, and a true understanding of what an object is, how it works, and what constitutes a well-designed class interface. This book has been developed from the ground up to be a Java text. It is not a “Java translation” of our previous texts. We have, however, retained our familiar easy-to-read style and clear approach to introducing new topics. Each chapter has the same overall organization as in our previous books, with a full problem-solving case study, testing and debugging hints, summary, and five types of exercises. Also, some topics, such as problem solving, are independent of the programming language and thus contain familiar discussions. Nell Dale received a B.S. in Mathematics and Psychology from the University of Houston in 1960, a M.A. in Mathematics from the University of Texas at Austin in 1964, and a Ph.D. in Computer Sciences from the University of Texas at Austin in 1972. She has been on the faculty at the University of Texas at Austin since 1975. She retired from full-time teaching in the summer of 1994 and is now teaching each Fall semester and spending the Spring and Summer writing and traveling. Chip Weems is an Associate Professor of computer science at the University of Massachusetts at Amherst. He received his Bachelor's and Master's degrees from Oregon State University in 1977 and 1979, respectively. He received a Ph.D. from the University of Massachusetts in 1984. Over the last 23 years, he has taught courses in introductory programming, software engineering, computer architecture, and parallel processing. Since 1986 he has co-authored 13 textbooks that have helped over a million students learn to program computers. His books have been translated into French, Spanish, and Russian. He conducts research in computer architecture, compilers, parallel processing, and compiler-architecture co-optimization. Mark Headington received his Ph.D. in Computer Science from Iowa State University. He is currently an Associate Professor of Computer Science, specializing in Operating Systems, C++, and Computer Architecture.